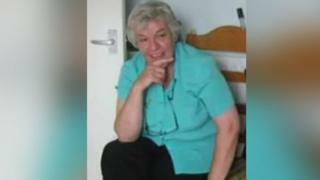 Image caption Joan Hoggett was described as a "lovely and helpful lady"
A masked teenager walked into a shop with a bag of weapons and then stabbed a worker to death, a court has heard. Ethan Mountain, 19, attacked 62-year-old Joan Hoggett without warning at the One Stop Shop in Fulwell, Sunderland, at about 22:30 GMT on 5 September. He has admitted manslaughter on the grounds of diminished responsibility. However, a jury at Newcastle Crown Court was told the prosecution has not accepted that plea and say he is guilty of murder. Prosecutor David Brooke QC said CCTV footage played to the jury showed Mr Mountain, of Heaton Gardens, South Shields, enter the shop before producing a knife and stabbing the great-grandmother. Mrs Hoggett, of Grindon, suffered 29 injuries, including 19 deep stab wounds, and later died in hospital. The jury was told Mr Mountain, who was in the shop for about a minute, left behind a holdall containing a hammer, sheathed samurai sword, machetes and three knives. The prosecution accepts the defendant, who had been sectioned a year earlier, suffered paranoid schizophrenia but say he demonstrated rational behaviour earlier on the day of the killing. Mr Brooke said it appeared to have been an attempted robbery. Mr Mountain later told a friend he had killed the shop worker because "the voices in his head told him to do it", jurors heard. The friend telephoned 999 about four hours after the attack and Mr Mountain was arrested. By that time he had thrown away the knife used to stab Mrs Hoggett and dumped his mobile phone in a pond, the court was told. Mr Brooke added: "It's not enough simply to be mentally ill. Suffering from paranoid schizophrenia in itself does not excuse a defendant's conduct."